His farm is located at Hosahalli, Ramanagaram district, Karnataka. “I prefer to grow multiple crops in the farm because it is helpful in maintaining the balance in annual farm revenues unlike high profits or loss in mono cropping. Amongst all the vegetables I am growing cabbage is the oldest as it being grown in my farm from last 20 years, rest of the vegetables keeps changing,” he informs. The vegetables are grown in either 0.5 or 0.75acre of land. None of the vegetable is cultivated in more than 0.75 acre. “This year I have grown beans, bitter gourd, ridge gourd, tomato, chow chow and marigold in 0.5acre and rest of the farm has cabbage cultivation.” He practices conventional method of farming using chemical agri inputs. His land is 4 acre is size. Mr. Hanumantharayappa recommends using nursery saplings for growing cabbage as scion develops within 3-4 days and mortality is almost negligible unlike farm prepared saplings in which scion develops only after 15 days and mortality is more than 10%. Price of nursery saplings is affordable. 30 saplings are available at Rs. 10. Cabbage is grown in 3-4batches round the year, “We make sure the patch of land used for growing cabbage keeps rotating. If we grow tomatoes, then after harvesting it we put cabbage in the same area. We will not cultivate same crop in the same land, it has to rotate,” he asserts and adds, “When one batch of cabbage is ready to harvest, we would have prepared other piece of land to grow cabbage. Intercrops are grown under the guidance of KVK to control pests and insects naturally. “KVK officials have suggested growing mustard as it attracts flies and pests and cabbage is saved. The results attained are good as production expenditure in cabbage reduced and yield obtained is good. Since past two years I am growing 1row of mustard in between 15-20 rows of cabbage saplings,” he asserts. Mustard and cabbage complement each other in terms of production process therefore are ideal crops to be grown as intercrops. “Marigold and sweet corn are also quite popular intercrops but it doesn’t suits cabbage. Sweet corn is good intercrop and pest controller for tomato, beans etc. Before KVK’s guidance, I was using marigold as pest trapper and intercrop. However the pests were not controlled much as in case of mustard plants. I used to incur expenses for spraying pesticides weekly once or twice or thrice a week. Later by learning from others and KVK, I have reduced the expenses of spraying pesticides,” he explains. 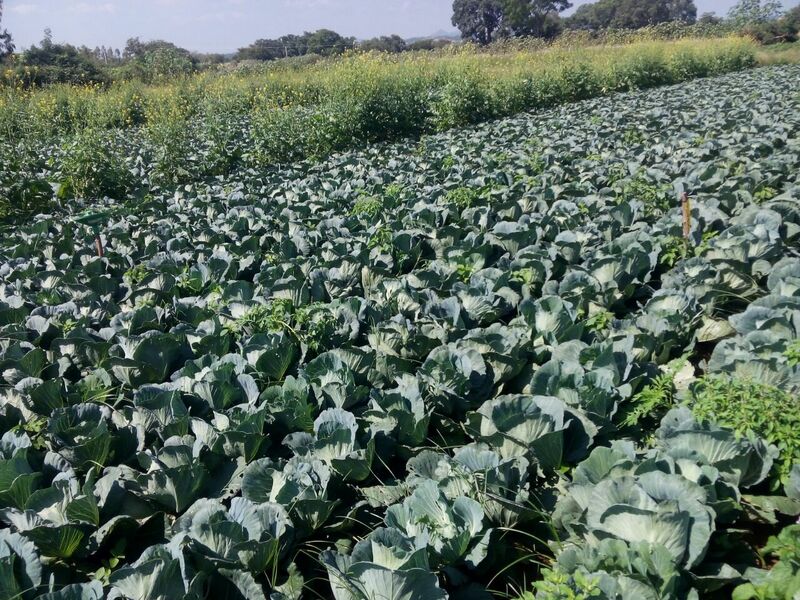 It is difficult to grow any other intercrop with cabbage because it is a 3 months crop. Other than growing mustard as intercrop sticky trap and attractive net are also used. In summer cabbage has threat from grasshoppers. “These insects affect the saplings by spoiling 7-8 scions. If scions are spoiled then cabbage is not developed. Once the plants grows grasshoppers doesn’t bother,” he says. In order to control the pests, bio-pesticides are continuously changed such as neem soap produced and supplied by KVK and next we spray garlic decoction so on. 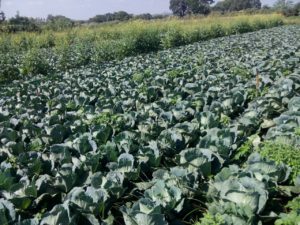 “If manures are given at right time and right quantity then it is possible to harvest cabbage 15days prior to the usual harvesting day. It needs less water in the growing state but needs more water after its bulb has developed fully. Water is given for an hour/day at this time through drip especially in summers,” he highlights. Production depends on development of plants. 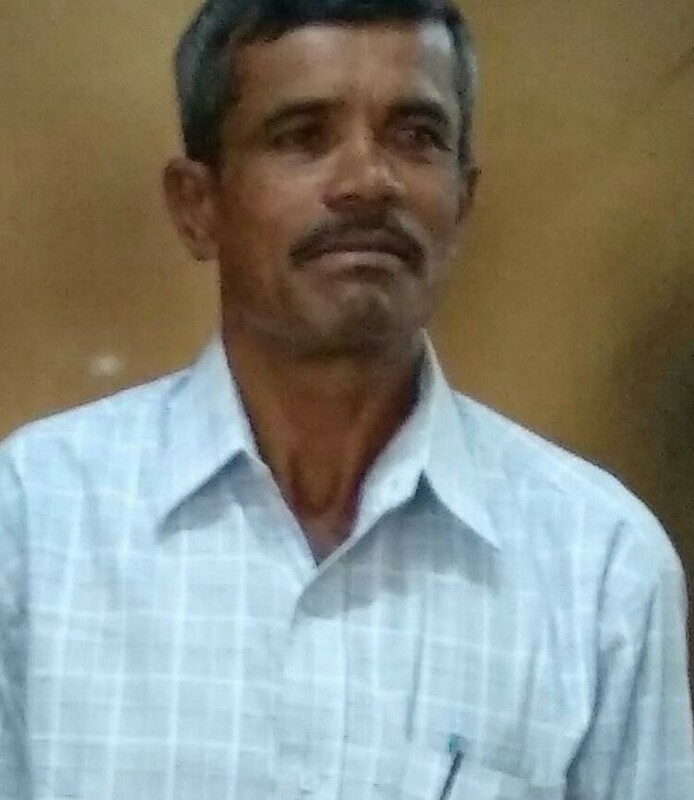 “In my farm I got the yield of 12 ton from 10 thousand saplings,” he informs. Entire produce is sold at Bangalore wholesale market. Price is totally controlled by market trends.